Jackie McSkimming (Scrymgour) is a proud Tiwi woman. Through her mother, Clare Scrymgour (Mollominni), Jackie inherited Tiwi identity and obligations as a member of the Maradui Skin Group. Her father Jack Scrymgour (Woods) was forcibly removed as a child from his home in Central Australia. Jackie attended St Mary’s Primary and completed her secondary schooling at Our Lady of Sacred Heart College in Darwin. She has four children – Caine, Michael, Erica and Billy. After leaving school at an early age, Jackie returned a few years later to complete and graduate at the old Aboriginal Task Force. Her new journey was just about to start. 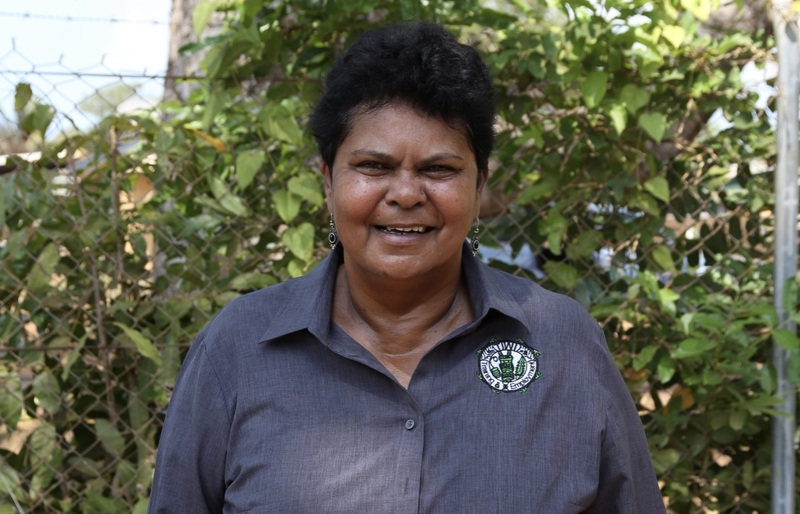 Jackie has held many positions, including the Top End Advocacy Service, advocating for Aboriginal elders in nursing homes in Darwin and Katherine, Indigenous Employment Consultant for Mission Australia in Darwin, Pine Creek and Katherine, and the Night Patrol. She then moved across to primary health working at Danila Dilba Health Service (1996-2014) and Wurli- Wurlinjang Health Service (2014-2015). After many years away from her island, Jackie was given the opportunity to return home with TITEB to work alongside her family at the Women’s Centre to help and teach her people. She is pictured here with the horticulture women.